Hello Holla Knitters and welcome to today's stop on the Summer 2015 issue blog tour! My contribution is a tutorial article 'Deconstructing the Knot Stitch' where I guide you through decreasing in pattern while knitting the knot stitch, seen in Annapolis by Kristen Jancuk. In the article, I break down the specifics of staying in pattern while working the Knot Stitch and include some helpful tips you can apply to future lace and texture patterns. I know I'm guilty of writing "decrease while continuing to stay in pattern when possible" (ahem, Holla Back Tank!) so it's a great skill to be able to master. If my exclusive article doesn't sell you on purchasing the issue, what about the designs? As usual, our fearless editor Allyson has selected a group of fresh and innovative pieces that take warm weather knitting to a whole new level. My two favorites are Beach House by Teresa Gregorio and Backbone by Kirsten Singer. I'm dreaming of a Beach House in HiKoo Rylie, a super gorgeous alpaca/silk/linen blend that I pet almost everytime I'm at work. I love the bright citrusy colors and this would be perfect in a pop of coral. The two color option of Backbone is GENIUS. I would use two coordinating colors of Manos del Uruguay Serena for an ombre effect. The only problem is choosing which color to be the main color! Which design from the Summer 2015 issue is your favorite? Comment before end of day (EST) Friday, July 3 and I'll pick one winner on July 4 to receive a copy of the pattern of their choice! Check out the rest of the Holla Knits blog tour for styling tips, behind the scenes info on the designers and more giveaways! I finished my Scallop of the Sea! This was super addictive knitting. Even if the KAL wasn't keeping me on track, anything with stripes always keeps me going, it's that "one more stripe" aspect! Katie made the lining for me so she could shoot the photo tutorial, which meant even less work on my end. It kind of felt like cheating, to go from knitting to sewing in a fully-made lining! Now I just need to find the perfect strap, since I am sooo not a clutch kind of girl. Hands free for dancing, that's the way I usually rock it out! Thank you all for entering the Wallpaper Cowl giveaway. The winner is Brenda--check your email for the pattern! 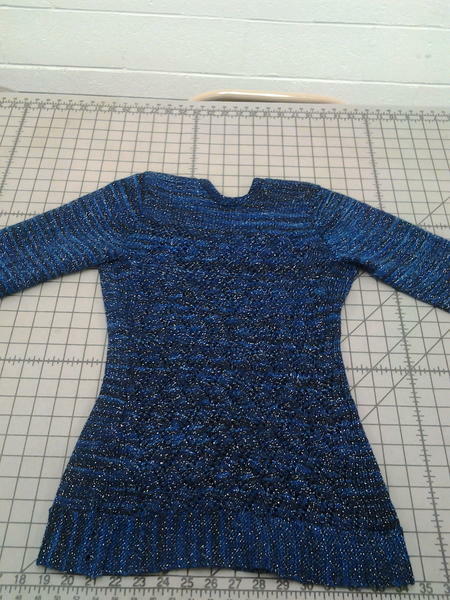 I finished my pullover juuuust in time for Rhinebeck. Blocked it yesterday and have to sew my buttons on tonight. If you happen to spy me in the crowd on Saturday, please say hi! I love meeting internet friends. Thanks to the support of everyone who voted, my Holla Back Tank was chosen for the inaugural Holla Knits KAL! Pattern is available for a reduced price of $3 until August 20th, when the KAL starts. 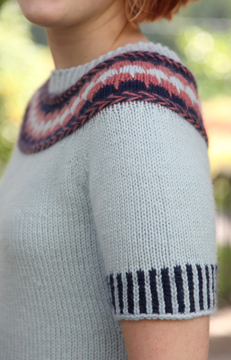 Katie Canavan (who designed Finishing School for the Spring/Summer issue) is leading the way, and she's already got posts up on the Holla Knits blog. Check out the prizes and other deets, and start swatching if you're ready to jump in! I've decided to knit a 3/4 sleeved version for a wintery Holla Back Pullover. I mentioned that brainwave on the Holla Knits Ravelry group and everyone loved it, so a bunch of us are talking sleeves! Some knitters are going to use multiple colors for their tanks as well, which will be really exciting to see. I think it's pretty much a requirement of Holla Knits to love color! The winner of the Holla Back Tank kit giveaway is: Karyn, who wrote "I love them all but I think I’d start with the Holla back tank and shorts or jeans. Or maybe the Umbre Louvre with white slacks…if only I could decide on a color scheme!" Thanks to everyone who entered--and for dealing with my super slow website. I'm in the process of getting that fixed so don't let it turn you off of coming back to see what I'm doing next! I read all your comments and love the way you would wear the looks from the collection, and you gave me some great ideas to make my tank sample more versatile. Hopefully you aren't too disappointed by not winning this giveaway and will still make your favorite Holla Knits pattern! Don't forget to check out the giveaways that are being hosted on the other tour stops, since your luck might change! Holla Knits is here! Head on over to the Holla Knits blog to see the whole collection and my Holla Back Tank. My interview with Johnny of FiberStory TV goes up on Wednesday, and don't forget to stop back here on Thursday for my review of the collection AND a joint giveaway with the Kangaroo Dyer!